I’ll Go On is an intimate portrait of the entwined lives of three characters: Sora, Nana, and Naghi. Over the course of several months, these characters tell their stories in sequence, in three very distinct but equally compelling voices. A quiet narrative—occasionally spiked with violent outbursts—about the suffocations of conventional domesticity, I’ll Go On critiques the social expectations policing gender in South Korea and probes intergenerational family trauma. Like much of Hwang Jungeun’s oeuvre, I’ll Go On portrays working-class lives through unsentimental depictions of suffering and hope. It shows how thoughtlessness, in its interpersonal, capitalist, and systemic manifestations, begets violence and precludes connection, prioritising provisional and realistic displays of compassion as the keystone of any ethical interaction. I’ll Go On is Hwang’s third work to be translated into English and, following her novel One Hundred Shadows, is her second published by Tilted Axis Press. In 2015 Hwang’s I’ll Go On received the Daesan Literature Award, one of South Korea’s most prestigious literary prizes. Known for foregrounding marginalised voices, making excoriating social commentary, and using experimental forms of writing, Hwang fulfils Tilted Axis Press’s mission to “shake up contemporary international literature.” I’ll Go On is beautifully and delicately translated by Emily Yae Won and clearly benefits from Won’s experience translating the work of literary heavyweights like Ali Smith and Deborah Levy into Korean. I’ll Go On begins with Sora, a young woman who recounts the brutal death of her father when she was ten years old, her mother’s subsequent descent into an all-consuming depression, and the family’s slide into poverty. Through a series of taemong or pregnancy dreams, Sora begins to suspect that her younger sister Nana is imsanbu, pregnant. Nana takes up the storytelling baton in the novel’s next section, charting her evolving understanding of motherhood and family, while further reflecting on the events of her childhood. Finally, Naghi, their childhood friend who, along with his mother Sunja, is part of the sisters’ found family, discloses his torturous unrequited love for another man. The novel’s threefold perspective means it often recounts the same events from different subject positions, presenting coexisting realities and allowing the novel to pack an impressive array of critique, compassion, and wisdom into seemingly unremarkable lives. The death of Geumju, Sora and Nana’s father, in a grisly industrial accident, resonates throughout the narrative and brings the imbricated themes of absent fathers and exploited working classes to the fore. Geumju is literally consumed by factory machines, his body processed and ground until it has been reduced to pulp. Phantasmagorically recasting machines as devouring beasts, the novel literalises the consumption of workers as a function of market optimization. Geumju’s story demonstrates that when workers can no longer maintain the speed of production demanded by predatory machinic processes, the result is death. It is a message that recalls Hwang’s One Hundred Shadows, which follows two working-class technicians as they try to carve out a life for themselves among the ruins of capitalist waste; in One Hundred Shadows, people are haunted not by hungry machines but by a shadow threatening to claim them if they fail to remain productive. Hwang Jungeun shares some central concerns, including the carnivorousness of capitalism and its impact on South Korean working-class communities, with another of South Korea’s most celebrated contemporary novelists, Hwang Sok-Yong. In Familiar Things, recently translated into English by Sora Kim-Russell, Hwang Sok-Yong recounts the debasements of Korean spiritual traditions and the accelerating exploitation of the working class as a result of capitalist expansion. Both writers’ depictions of South Korea’s working class make visible the destitution which undergirds (inter)national myths about South Korea as a paragon of capitalist prosperity. With the unmitigated and escalating rise in global wealth inequality, both writers’ reflections are timely and necessary. The “I” does not stand apart from the prevailing matrix of ethical norms and conflicting moral frameworks . . . We cannot conclude that the “I” is simply the effect of or the instrument of some prior ethos or some field of conflicting or discontinuous norms. When the “I” seeks to give an account of itself, it can start with itself, but it will find that this self is already implicated in a social temporality that exceeds its own capacities for narration. Rather than cohesive and continuous, as a subject Sora is full of voids and ellipses, and she demonstrates how the novel's storytelling strategies can both constrict and liberate, but only ever in partial, incomplete ways. Hwang’s fractured characters also use stories to try to tease out their own and others’ motivations—which often remain opaque—to form imperfect but functional forms of mutual understanding. You’re not even aware of being swallowed up by the machinery of her tale . . . they’re as potent as a putrid peach or the most enthralling of poisonous spells. Listening to her words your head starts to droop with their sticky juice trickling down your ears, until all you can do is succumb to their saccharine flow. Here, as throughout the novel, the sometimes seductive “machinery” of storytelling is placed front and centre, particularly its function of bolstering societal metanarratives about family and gender. Aeja, as both the teller and victim of stories, is a case in point. When the sisters remember passages from their childhood, it becomes clear that Aeja shaped their understanding of themselves through the relentless retelling of their father’s death, a cycle of perpetual mourning from which she cannot extract herself. The role of storytelling as a means of standardising social expectations is also made apparent through the parents of Moseh (the father of Nana’s unborn child), whose lives are portrayed as a middle-class nightmare of malaise mediated only by the pacifications of television. Nana questions these stories about family-making by refusing to adopt the pre-established model of the nuclear family, to instead give “proper thought” to her actions. The novel’s third storyteller, Naghi, addresses the reader directly in the second person, a notoriously difficult narrative technique to pull off, but done here with aplomb, in the novel’s most poetic voice. Characterised by his gentleness, queer sensuality, and loyalty to those closest to him, Naghi manifests the kind of masculinity bell hooks has called “feminist manhood,” which contrasts strongly with the masculinity of the novel's violent and absent fathers. Again, storytelling is a key component here, for Naghi’s renarrativising of his father’s death becomes a means of resisting the foreclosures of conventional masculinity, whilst building new ways of being, so that “we wound up rewriting the ending to my father's life as we saw fit.” Naghi’s alternative form of masculinity offers a new kind of surrogate father from which queer kinships can emerge, with family based on alliances and mutual respect rather than social obligation. I had been expecting a ta-dum ta-dum sound; instead we heard a loud sshaa sshaa sshaa. Zig zig zig zig goes the tiny heart, beating at a faster pace and to a different rhythm than my own. Repetition also operates on the level of sentence fragments, as each character has their own constitutive refrains. Peppered throughout Nana’s narrative is her circling and repeating of the phrase “I’ll go on;” the repetition of which restates not only the need for perseverance in the face of grinding working conditions and historical neglect, but also acts as a self-fortifying rallying cry and an acknowledgement that she is continuing to tell a story. Nana’s refrain makes clear reference to the end of Samuel Beckett’s The Unnamable: “Where I am, I don’t know, I’ll never know, in the silence you don’t know, you must go on, I can’t go on, I’ll go on.” For Naghi, his refrain is the melancholy “it has been too long since I last saw you,” a reflection on the passage of time, laced with longing. Each personal refrain becomes a mantra, a talisman adding rhythmic structure to the novel at large. The novel to some extent already engages with itself as a potential artifact of translation by incorporating English words that have become absorbed into Korean. Words such as mystery (misuteri), stalker (sutohkah), and damage (dehmiji) are used by various characters, their English origins always noted and remarked upon. References to Naghi’s workplace, “Bar Wage,” whose “dimensions . . . so closely approximated the English word bar—a stick, basically,” are one example of how Hwang acknowledges the presence of translation in everyday speech, the way words can run around and misbehave. Due to its preoccupation with words, structures, gaps, voids, and the making-strange of language through repetition, in many ways I’ll Go On is a perfect novel for translation. To do justice to such a challenging text demands a high level of skill. 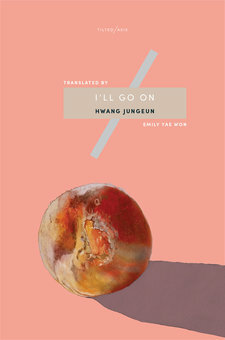 It is testament to Emily Yae-Won’s own writerly abilities that she has sustained such a delicate translation of I’ll Go On, remaining faithful to Hwang’s linguistic and narrative experimentations without sacrificing the human dimensions of the story. Rachel Hill is a writer currently based in London, where she is studying for an M.A. in cultural studies at Goldsmiths, University of London. Her interests include science and technology studies, speculative fiction, and fiction in translation. She has previously written reviews for publications including Strange Horizons, Rain Taxi: Review of Books, and Foundation: International Journal of Science Fiction.